Because the area of Hakone is steep and mountainous, people have been awed by the mountains and have worshipped them as sacred. The area was a place for ascetic priests to practice. One such high priest, named "Mann-gan Shonin", constructed Hakone-jinja Shrine at Motohakone during the Nara period (8th century). 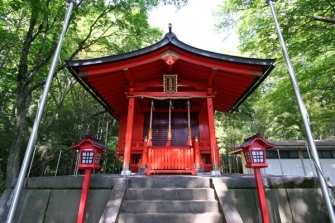 Minamoto no Yoritomo hid at Hakone-jinja Shrine after being defeated in the war of Ishibashiyama (12th century; before the onset of his administration); as a result, the shrine was increasingly supported by samurai believers, which extended its influence.